We are engaged in manufacturing an array of Designer Cat Collars which is also exported to various nations like Japan, Italy, Russia and Australia. 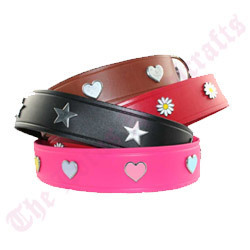 Manufactured using high quality material, these cat collars are prepared with sturdy metal clasps. We take good care of finishing which ensures no uneven edges which could harm the cats. The Lotus Handicrafts is one of the recognized name in manufacturing and exporting of Equestrian and Pet Products in a variety of premium grade leather to clients spread all across the world.